Red Wings defenseman Kyle Quincey scored in his return from injury on Wednesday night but it wasn’t enough for Detroit, as the Los Angeles Kings rallied in the third period for a 2-1 win. Quincey had missed two games with an ankle injury before returning – along with Brendan Smith – to the Detroit blue line. Johan Franzen also returned from injury but the team lost Valtteri Filppula. Quincey’s goal, scored at 9:42 of the first period, came on an improbable play. With the puck being cleared around the left wing boards, Quincey pinched in and threw it at Kings netminder Jonathan Bernier. Bernier knocked it high into the air with his glove, then lost track of it as it came down, bounced off his own back, and into the net. It stood for over forty minutes as the game’s only goal, through a second-period stretch that saw the Red Wings kill off a four-minute LA power play, of which a full two minutes was a two-man advantage. The Kings finally got on the board during another five-on-three. With 9:34 remaining in regulation, Jeff Carter tipped an intentionally-wide shot by Mike Richards past Detroit goalie Jimmy Howard to tie the game, 1-1. With 4:48 left the Kings took the lead. D.J. King dug the puck out from along the right wing boards and sent it to Anze Kopitar all alone in front of Howard, where he had time to slide the puck around him to make it 2-1. Detroit would be unable to even things back up. Howard finished the night with 27 saves on 29 shots. Bernier stopped 32 of the 33 chances he faced. Carter’s goal was the only power play goal of the night. Detroit had three tries with the extra attacker while Los Angeles had five, including 2:46 of five-on-three time. The Red Wings will be back in action Thursday night in San Jose. With Quincey and Smith returning from injury, Kent Huskins and Ian White were the healthy scratches on defense for Detroit. I’m gonna be fast because it’s late. You don’t usually deserve to win a game where you score one fluky goal. It would have been somewhat embarrassing if Kyle Quincey‘s bouncing mess of a first-period tally was the only goal of the game. That said, there’s a bad feeling about the Kings scoring the tying goal on their third minute of five-on-three in the game, in a game where the Wings saw no five-on-three time. There’s something that feels wrong about the Kings tying it up after Dustin Penner wasn’t called for his high hit on Brendan Smith, with a goal where the puck came free because of a trip. The Wings may not have done enough to win this game, but it doesn’t seem like the Kings did either. This past weekend Team Tootoo finally made its presence known in the Detroit area. Not much talk anymore about impact the lockout had on the communities; but one angle that was not touched on often were charity events. Annually the Detroit Red Wings have the Salvation Army Red Kettle bell ringing competitions with players and staff trying to raise money. This year the Alumni took over; but it just didn’t have the same appeal as in the years past. Charitable work and humanitarian contributions are highly regarded within the hockey world to the point that the National Hockey League established the King Clancy Memorial Trophy in 1988. The trophy is awarded annually to the player that best exemplifies leadership qualities on and off the ice and has made a noteworthy humanitarian contribution to the community. Everyone has their own causes. I have been a volunteer with the American Special Hockey Association (ASHA) since 2009. I am even running my first half marathon this coming October to hopefully bring some awareness and donations to this wonderful non-profit that brings the game we all love to those with developmental disabilities. One of the newest Red Wings, Jordin Tootoo, has his own way of doing things off the ice. Tootoo created the Team Tootoo Fund to collect money either by donation, selling items, and even money collected at signing events (like the one coming up this Saturday from 4p.m. – 6p.m. at the Gibraltar Trade Center). The Team Tootoo Fund collects the money and then writes grants out to suicide prevention and at-risk you charities in need; so when I was asked if I could help out at two events this past weekend I was glad to do so. Last Friday I left work and drove down I-75 to Troy where Tootoo was signing autographs and taking pictures with fans for a donation of $22 to Team Tootoo. There were 222 wristbands handed out so you can go ahead and do the math on that one. Plus a few customers that stopped in unknowing of the event taking place donated to the cause. Saturday Tootoo’s former team the Nashville Predators were in town so it was a great opportunity to set up a booth at the game for Team Tootoo. Heather and I sold items that included Team Tootoo wrist bands, hats, autographed items and even a pair of jerseys to fans at the game. Met a lot of great people over the weekend, including Jordin himself. Fan reaction at the game was varied. Many fans are embracing Detroit’s latest tough guy; and some not so much. One couple even showed up to the game with their own t-shirt’s they had screen printed to say “Team Tootoo” on them. Predators fans came up (even it if was only “up” as they came North to Detroit via Windsor on their trip from Toronto – don’t ask me why they were not Leafs fans but at least they were not the group that had that soul shattering Tootoo whistle with them). Working on the concourse during the game I saw none of the 4-0 blowout of the Predators; but I wouldn’t have changed that for anything. The experience was great, the opportunity to maybe even convert some fans that were still on the fence about Tootoo to seeing part of the off-ice side of him and becoming fans was great; but the best part was knowing that even if the money raised only helps one youth it was well worth it. If you are interested in donating to Team Tootoo you can do that on the website. that are for sale at the same price as the Tootoo items. Be sure to follow @TeamTootooFund on Twitter and on Facebook. Stay tuned to Off-Ice Instigating and DetroitHockey.net for Team Tootoo events and news. When I put together my second round of thoughts on the NHL’s planned 2013-14 realignment, I wasn’t trying to be optimistic. Re-reading them in the context of the series of tweets about the realignment plan by TSN’s Bob McKenzie today makes me think I was being naive, however. Add in reports from ESPN’s Pierre LeBrun and it doesn’t get better. Top 3 teams in each of two 8-team East conferences make the playoffs. Two wild cards from remaining 10 East teams also make the playoffs. Top 3 teams in each of two 7-team West conferences make playoffs. Two wild cards from remaining 8 West teams also make the playoffs. That sure sounds like two conferences with two divisions each, not four conferences. And LeBrun confirms, though he and McKenzie disagree on which naming convention for the divisions is the first choice. And a unique idea that would have made for an interesting set of possibilities in the third and fourth rounds is gone. Don’t get me wrong, I still like the realignment. Greedily, all I wanted out of realignment was more Original Six matchups for Detroit, with more games in the Eastern Time Zone as a secondary goal. I think the playoff system is ridiculous, though. I’ve said before that the regular season and getting into the playoffs is about how high you finish, not how far from the bottom that is. There is no need for a wild card because fourth place in a seven-team division is the same places down from the top as fourth place in an eight-team division. If you’re accounting for disparity between divisions by allowing for a crossover (and that’s what this is, not a true wild card), why not account for disparity across conferences as well? Because that would be hard. The way I see it, there should be either no wild card or there should be four wild cards shared across all divisions. If the #5, #6, and #7 teams in the Pacific are better than the #4s in the rest of the league, why should only the #5 get a chance to cross over? The crossover is an overreaction to a problem that doesn’t exist, though. The divisions are not created equal. The conferences are not created equal. The amount of talent isn’t the same, the amount of travel isn’t the same, and – yes – the amount of teams isn’t the same. That’s not a problem. Adding the crossover is an attempt to fix what isn’t broken. The Detroit Red Wings announced the signing of defenseman Brian Lashoff to a three-year contract extension on Monday. Lashoff, 22, is in the final year of his entry-level contract. He signed with the Red Wings in 2008 after going undrafted and had been unable to break into the NHL until injuries decimated the Red Wings’ blue line at the start of this season. With the Red Wings missing Jakub Kindl, Carlo Colaiacovo, Jonathan Ericsson, Ian White, Brendan Smith and Kyle Quincey at various points this season, Lashoff has appeared in fifteen of Detroit’s nineteen games. He’s scored a goal and added two assists while going -4, playing on all three defensive pairings and getting opportunities on both the power play and the penalty kill. In 125 career AHL games with the Grand Rapids Griffins, Lashoff has nine goals and twenty assists. The deal will reportedly carry a salary cap hit of $725,000. It is a one-way deal for all three seasons. One thing that’s really sticking with me about the reaction to the NHL’s proposed realignment for the 2013-14 season is the insistence on thinking of it in terms of the existing alignment. This new alignment does not have the Red Wings and Blue Jackets moving to the Eastern Conference. The Eastern Conference is gone. As is the Western Conference and all of the divisions. 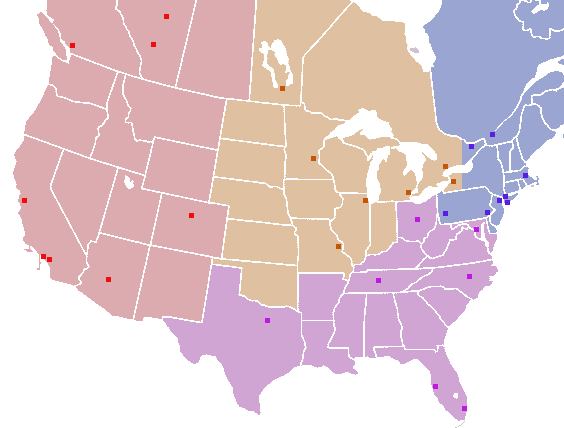 Yes, the four new conferences are roughly analogous to four of the current divisions, but that’s because the league is already geographically aligned. If you give the conferences non-geographical names, it’s not as awkward for the Montreal Canadiens to share a conference with the Florida Panthers. After all, is the distance really that much worse than the Los Angeles Kings and Edmonton Oilers? It only looks bad because Montreal belongs in an uber-Northeast Division, while the Panthers and the Tampa Bay Lightning clearly do not. Call that the Adams Conference and some of the dissonance goes away. As I said via Twitter after the news broke, I don’t like that the only reason the Florida teams are in the uber-Northeast is because the current Atlantic Division was treated as sacred. Can’t break up the NYI/NYR/NJ triumvirate, can’t break up the Pennsylvania teams, can’t really even break up Philadelphia and New Jersey. Now all five teams are tied together, which means that any realignment starts with the Atlantic Division and how to not break it up. I understand this, because I look at plans that say the Red Wings should have to span three time zones just to keep their rivalry with Chicago and I see what being told what your team wants doesn’t matter looks like. That said, I also look at Toronto Maple Leafs bolting the Central Division early in 1998 and wonder why the Atlantic Division is any more sacred than a division centered around Chicago/Detroit/Toronto. Yeah, the Southeast could have St. Louis instead of Columbus. The Atlantic could have Buffalo instead of Ottawa. Colorado could be in the Central. However you shake it out, there could be four conferences with the Atlantic Five kept together and the Florida teams in a conference of contiguous states. Doing that, however, would leave you with three conferences that span multiple time zones and would break up Toronto and Montreal. It would get the Chicago/Detroit/Toronto conference back, however. Actually, as much as I like the proposed realignment, I kind of like this one a lot, too. One benefit of the above proposal is that it helps with the Quebec problem. In the NHL’s plan, the uber-Northeast is an eight-team conference. It’s also the only conference Quebec could reasonably go into. That means that if the league ever adds Quebec, realignment becomes an issue again. In the above proposal, Ottawa (or Buffalo, if you swapped them) could slide into the neo-Central to open up a spot for Quebec. Colorado being able to fit in either the neo-Central or the pseudo-Pacific helps give flexibility, too. In the league’s proposal, it looks like the best option would be for the Red Wings to slide back into the neo-Central, leaving them back where they started. Another (even uglier) option might be to swap the Florida teams into the neo-Central and push Colorado back to the pseudo-Pacific. One last thought: I have to think that NBC is absolutely salivating about the possibility of a Stanley Cup Final played entirely in the Eastern Time Zone. We don’t know the exact playoff format yet but the opening two rounds are expected to be intra-conference. If the conference champions are then seeded in the Stanley Cup Semifinals based on regular season finish, it’d be possible for the winners of the uber-Northeast and the Atlantic+ to meet in the Finals. Of course, the flip side is also true, as a Finals with no Eastern Time Zone team would be possible. Two Red Wings rookies led Detroit to an 8-3 rout of the Vancouver Canucks on Sunday, as Joakim Andersson and Damien Brunner each scored twice to supply half the team’s goals. In all, seven Red Wings had multiple points as Wings won their second game in as many nights. The twelve goals the team scored over the weekend matched their total over their previous five-game losing streak. It was the Canucks who scored early and even carried a lead into the first intermission before the Red Wings scored five unanswered goals to end the game. Daniel Sedin opened the scoring at 5:45 of the first period on a patient passing play with brother Henrik. The two traded off the puck several times in the Wings’ zone, looking for an opening. Henrik took it behind the net and Daniel jumped into the slot alone to take a pass and snap a shot past Detroit netminder Jimmy Howard. Jordin Tootoo evened things up with 8:52 remaining in the period. Coming down the right wing, his initial centering attempt was blocked by Jason Garrison but he picked the puck back up and threw it to the front of the net again, with it bouncing off Keith Ballard before hitting the inside of the post and going in behind Vancouver goalie Roberto Luongo. It was Tootoo’s second goal as a Red Wing, with both deflecting in off a defender. Niklas Kronwall gave Detroit their first lead just 1:29 later. Pavel Datsyuk prevented a Vancouver clearing attempt at the left point and drove to the net, drawing a delayed penalty. He and Daniel Cleary kept control of the puck into the right corner before sending a pass out to Kronwall at the blue line for a slap shot that deflected past Luongo. The Canucks would stage a rally with a pair of quick goals of their own late in the period. Daniel Sedin tied the game with 3:42 remaining in the period. Henrik Sedin sent a long pass from his own side of center into the Red Wings’ zone and off the endboards to Daniel streaking in off the left wing. Having gotten around Jonathan Ericsson, Daniel backhanded a shot past Howard from in close to make it 2-2. Just 2:08 later, Chris Higgins picked the puck off Justin Abdelkader‘s stick in the right faceoff circle and raced behind the net for a wraparound chance that went in on the far side of Howard. Cleary began the Red Wings’ charge with a power play goal at 2:57 of the second period to tie things back up. Brunner picked up the rebound of his own chance from the right circle and shoveled it across to Cleary, wide open to jam the puck home at the far side of the net. The Red Wings thought they had a lead with 5:40 left in the second when Patrick Eaves knocked a loose puck past Luongo on a delayed penalty but the play was blown dead before the puck went in. On the ensuing power play, however, Henrik Zetterberg netted a goal that did count, tipping a pass in the slot from Datsyuk on the right wing through traffic and past Luongo. After an apparent Datsyuk goal was correctly waived off for being played with a high stick, Brunner extended the Red Wings’ lead with another power play goal with 42 seconds left in the period. Kronwall’s shot from the top of the right circle was kicked out into the slot where Brunner picked it up and cut towards the bottom of the right circle, where he lifted a shot over a sprawling Luongo. Brunner made it 6-3 at 9:36 of the third period, throwing a knuckling shot from the top of the right circle on net and past Luongo. Andersson scored his first of the night with 3:21 remaining in regulation, rifling a shot from the top of the left circle that was tipped by the outstretched stick of Ballard to get past Luongo. He added another to close out the scoring 52 seconds later, taking a feed from Brunner at the left side of the slot and slapping a chance past Luongo. Luongo entered the game with the best goals-against average in the league. He stopped 20 of the 28 shots he faced on the night and dropped to tenth in the league in GAA. Howard, who was slated to have the night off until backup goalie Jonas Gustavsson‘s groin injury resurfaced, finished the night with 18 saves on 21 shots against. Detroit scored three power play goals on five chances with the extra attacker, plus an additional goal on a delayed call. Vancouver was scoreless on their two power play tries. The Red Wings now head out for their first trip West of the season, facing the Los Angeles Kings on Wednesday. The Detroit Red Wings called up goalie Tom McCollum from the Grand Rapids Griffins on Sunday. McCollum will back up Jimmy Howard in the Red Wings’ 5:00 PM matchup with the Vancouver Canucks, a game Jonas Gustavsson was scheduled to start. Gustavsson is back on the shelf, having aggravated the groin injury he’s battled all season. After replacing Howard late in the season opener, Gustavsson did not play again until a rehabilitation start in Grand Rapids last Sunday and another relief appearance on Tuesday in Nashville. Sunday’s game was expected to be Gustavsson’s first start with the Red Wings after he signed with them in the 2012 offseason.